Today is the start of Spiderforest’s Comic of the Week promos! Every week we’ll be featuring two Spiderforest comics for your reading pleasure. Make sure to check ’em out! Sombulus: A flippant magical scavenger is thrown together with a tinkerer who talks to machines, and a paladin on a god-given mission to thwart evil. As they battle immortal kings, fix flying toasters, unravel the fabric of reality, and brave the line at Wingbucks during Treea Spice Latte season, they learn to rely on each other to solve the problems they find… and the ones they create. 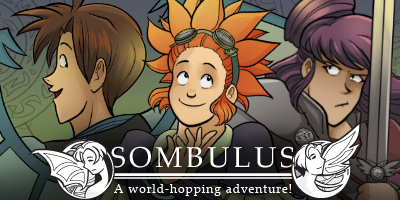 If you’re looking for a fantasy comic to make you laugh, Sombulus is the place to go. Running for over 6 years, it has a pretty nicely-sized archive, and it’s a hell of a read. I’ll admit I laughed a little too loudly several times trying to sneakily read through it at work. All the characters are super lovable, the jokes are hysterical, and it’s an all-around good time. Also, Delphina’s the one who always posts silly pictures in the comments section. If that’s not enough reason to check out her comic I don’t know what is. 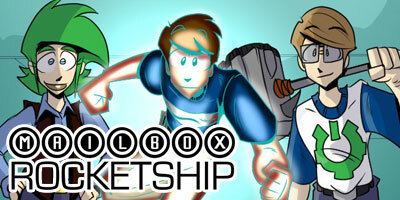 Mailbox Rocketship: Aliens, magic, super powers and Death himself. Keith’s life just got complicated. MR is one of the newest additions to the SF collective and was featured on the site recently, so you may recognize it from the last few updates! If you haven’t read it already, here’s destiny giving you another shot. Because here it is again. Look at it. Look. This comic reminds me a lot of the anime that was on CN when I was a kid: Very silly and pretty “out there”, but a whole lot of fun to watch. (Or in this case “read” I guess) It has a science hammer in it! SCIENCE HAMMER, GUYS. I want one. No wait, 10. 10 science hammers on my desk by Friday no excuses. And read the comic in the meantime! !